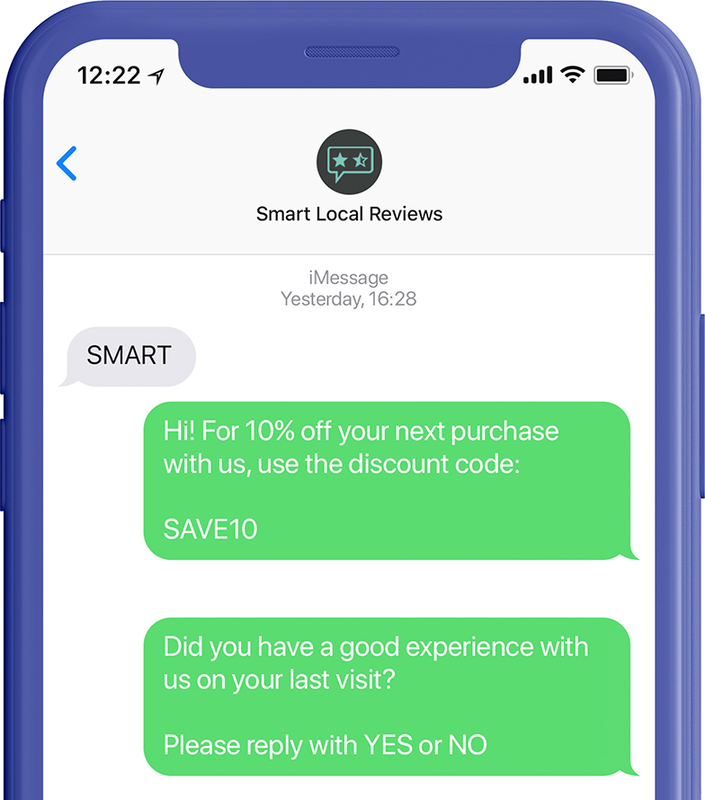 Smart Local Reviews helps small businesses attract more positive reviews and incentivize repeat customer visits through text message marketing. Positive reviews create trust with consumers, and cause them to spend up to 31% more with your business. A single negative review will stop 22% of consumers from buying from your business. After three negative reviews, that number grows to 59%. Negative reviews in your business's search results can drive away 70% of potential customers. Reach your customers when they're in the right mindset! When a customer texts your code, they're actively interacting with your business. They're more likely to leave a review and more likely to have positive feelings towards your business. You're offering your customers a coupon or deal. They're going to come back to take advantage of it! Customers will feel more positive about your business and look forward to returning. Customers who reply that they had a negative experience are given a different link. Instead of sending them directly to your review page, they're directed to a private feedback form, allowing you to personally address their issues.